The National Yacht Club is holding its biennial Regatta on Saturday 23rd June 2018. 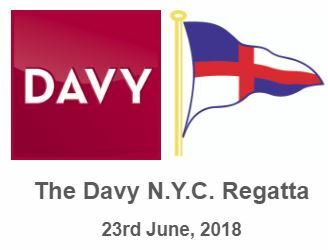 With a great programme of entertainment ashore and guaranteed great racing on the water, the NYC Regatta is a date not to be missed! We would like to express our thanks and gratitude to our Regatta main sponsor 'Davy'. Employing over 600 people, Davy offers a broad range of services to private clients, small businesses, corporations and institutional investors, and organises its activities around five interrelated business areas: Asset Management, Capital Markets, Corporate Finance, Private Clients and Research. SI and Schedules below (please note that printed and laminated copies will be dispatched to the Clubs / marina on the waterfront for each boat entered - if not, they will be available in the NYC Race Office. We would like to express our thanks and gratitude to our Regatta main sponsor ‘Davy‘. Employing over 600 people, Davy offers a broad range of services to private clients, small businesses, corporations and institutional investors, and organises its activities around five interrelated business areas: Asset Management, Capital Markets, Corporate Finance, Private Clients and Research. SI and Schedules below (please note that printed and laminated copies will be dispatched to the Clubs / marina on the waterfront for each boat entered – if not, they will be available in the NYC Race Office.